The site for John Simpson falls into the “little cost and protected time” category. Social Media, photo and video galleries, blog, and links for financial support as well as newsletter integration were top needs from the get-go. 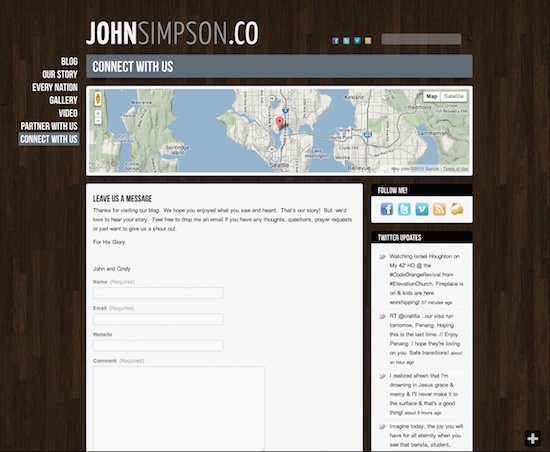 JohnSimpson.co is an example of the Big City Theme with a few custom tweaks. I consider Big City a quality theme and was glad to work with it. John selected the theme after I introduced him to ThemeForest.net, he knew the background and “feel” he wanted, the photos he needed, and even the site map (pages structure) he required. John was smart because he had the vision for his site right from the get go. Designers (and developers/helpers) love this, because when a vision is clear, they know they can make it happen. It was easy to get it done for him in no time with such direction. Plugins used included AddThis, RefTagger, and YIKES, Inc. Easy MailChimp Extender were all plugins incorporated in the site. 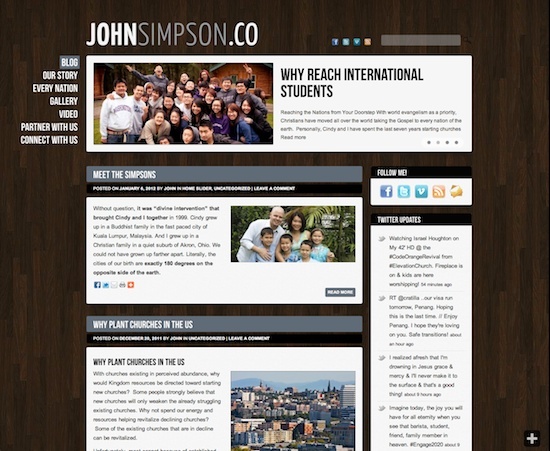 JohnSimpson.co is the blog of John Simpson, a career missionary to New Zealand, Malaysia, and now, most recently, Seattle, WA. You can read more about his story on the site.